Second race of the Caribbean Tour 2010 is done. The start happened in the Half Moon Bay, an amazing bay rounded by palm trees and an incredible beach on it, a true paradise and ended up 25km further away at the Turners Beach. The forecast predicted a half meter swell and not more than 10knots of wind, suggesting a flat, hot and sunny day. 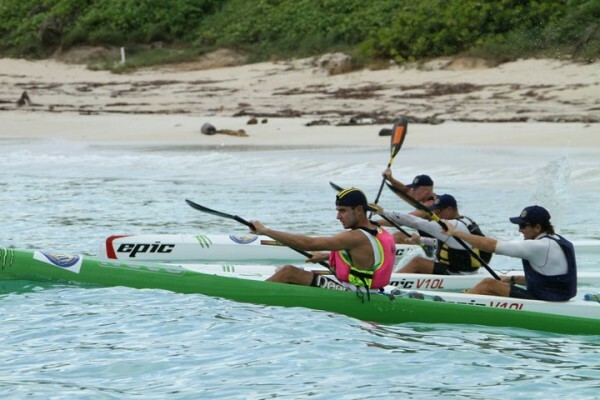 The race started around 10:30, with a on water start, a hotspot right on the end of the bay 200m after the start, made it very interesting, with Tommy Karls and Henrique Silva fighting for the lead, but this time the Portuguese just got it. After the hotspot Tommy Karls just flied into the lead, getting a comfortable gap for Jose Antonio (Spain) and Henrique Silva. The first 10km were bumpy with some wind coming in, after this, unfortunately and as expected at the beginning, the flat and the heat showed up, making it hard for everyone. At the end the winner with 2h00m18s Tommy Karls SWE , on 2nd place Jose Antonio ESP with 2h02m44s and on 3rd place with 2h06m54s Henrique Silva POR. On Sunday we will have the race on Guadalupe, some swell and wind are expected. This will be the race that will let know the winner of the Caribbean Tour 2010. Everything is still open for Tommy Karls and Henrique Silva sharing the lead and Jose Antonio in second place but still in the fight.